Aughavas, Achadh Easa, takes its name from the Eas, or waterfall, on the stream which still pours down close to the present Catholic Church. There is not, now that Aughavas Lough has been completely drained,Rolex Replica one separate waterfall on the river, but rather a series of falls or cataracts as the water crashes from rock to rock in its fall.. Even so, especially after heavy rains, the booming noise is sufficiently noticeable to explain how the area got its name, The Place of the Waterfall. Tradition has it that St. Patrick passed this way on his mission to destroy the pagan idol of Crom Cru near the village of Ballymagovern in West Cavan and that he blessed the well called after him in the townland of Cavan. Whether there ever may have been a Cill or Chapel there is doubtful, but St. Patrick’s Well is still a place of pilgrimage on his feastday, and the little cemetery, still in use, reminds us this is sacred ground. The Aughavas district for most of its time since Patrick would have been a land of rivers, lakes and forest. It figured briefly in history in the mid -1600’s , when Owen Roe O’Neill used it as a winter base and a training and recruiting ground for his army of the North., and thereafter when it was brought back to subjugation by the Cromwellian forces. Its population then would have been small. Pender’s Census of 1659, though it lists only 12 townlands of the parish, records for these 12 a total of only 85 persons. Granted that under- 15’s were not included, and granted too that Pender’s figures, it is calculated, should be multiplied by between 2 and 3, a figure of 300 or so for the 12 areas given would not seem amiss — and for all of the parish maybe 500 or less. Indeed the total population of the County Leitrim at the time would appear not to have exceeded 11,000. For most of its history, certainly since the Reformation and probably for centuries before that, Aughavas formed part of the parish of Cloone — as also did Gortletteragh. However, by 1700 a change was coming. Population, for whatever reason, was on the increase. The ‘Register of Popish Priests’ of 1704, shows three priests for Cloone — Thomas Flynn, residing in Errew, Daniel Gaffney in Tuma and Hugh Cannon in Drumdarkan. Errew is in Gortletteragh of to-day (and that Fr. Flynn later became Bishop of Ardagh and has his grave and tombstone just inside the gate of Cloone graveyard.). ‘Tuma’ (now Tooma) is in Aughavas parish (and a faint tradition still recalls some chapel connections in that townland); and Drumdarkan is in Cloone parish still. When exactly Gortletteragh and Aughavas were officially separated from Cloone is a mystery but it might be provisionally dated to about 1760, for it would seem that a chapel was built in Aughavas about that time. Aughavas townland was chosen for its site probably because it was about the dead centre of the parish (and it is from the townland of Aughavas and its chapel that the parish got its name). This chapel of Aughavas, like all Penal-day chapels, would have been small — a roughly built, mud floored, thatch-roofed, barn-style construction — all that a poor, if growing, Catholic population could rise to. It was used, tradition says, for threshing corn on week-days — possibly being the only building high enough for flails to be wielded - It was also used, certainly from the 1790’s, as a schoolhouse, with one end of the chapel catering for younger pupils and the other end housing a ‘Classical’ school. William O’Higgins,later Bishop O’Higgins came here from his native Drumlish to be educated in this Classical school run by the Franciscan Fr. Gregory Anthony Dunne in this chapel. He later attended another Classical school in Drumsna before going on to be a student in Paris. While he was at school in Aughavas he lodged in Campbell’s of ‘Campbell’s Point’ in Corroneary. Fr. Dunne, too, lodged in Corroneary, in a house which still stands, now owned by Michael McIntyre. That old chapel which these men made famous was replaced in 1837 by another built by Fr. (later ‘Dean’) William Eivers. It would have been similar to its predecessor, only bigger, and with a slated roof instead of thatch, but this roof got damaged in the disastrous ‘Big Wind’ of January 1839. Whether it was due to that damage or not, Fr. Joseph McGivney when he came as P.P. to Aughavas in 1920 decided to replace rather than repair it, and by 1922 he had started his fund-raising for a new chapel. He appealed to people everywhere, but especially to Aughavas folk in the States, and succeeded so well that he could start his Church in 1925. He had it built on a new and more accessible location. Parishioners supplied the labour, the site itself provided the stone, and Fr, McGivney himself provided the inspiration, working manually as hard as the best. Two years it took to construct, and two more before its debt was cleared enough for it be consecrated. Many years later a bottle was found under the floor of the sacristy with a note inside it which read : ‘This Church was built in the reign of Pope Pius XI, Joseph Hoare Bishop of Ardagh and Joseph McGivney Parish Priest. Foundation 1 July 1925, finished June 1927. Pray for the priest who worked hard to build it. May God save it for ever. Amen’ The Church cost in all £10,000 — of which Fr. McGivney himself contributed £450. 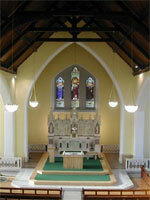 Its High Altar, which remains untouched, came from a Church in Portadown and is of Caen stone. Because the people of the Rossan area would have up to 5 or more miles to come to Aughavas, Bishop McNamee gave permission for Sunday Mass to be said in the local school. In 1964 the old school gave way to a new Chapel, dedicated to St, Stephen, built at a cost of £15,000. Fr. Molloghan being P.P. and Fr. P. O’Flynn CC. Footnote . Fr, Gregory Anthony Dunne, O.F.M. was educated in Louvain and later taught in a Franciscan Seminary in Flanders. Due to conditions on the Continent after the French Revolution he returned to Ireland, and, about 1794 was appointed C.C. in Aughavas’ where he saw the need for education and took on the job of providing it. It was the fame of his school that drew William O’Higgins to it. In 1798 when the French and their Irish allies reached Cloone, Fr. Dunne was invited to meet them being fluent in French and the French not fluent in English. And so he was there, probably in Mr. West’s, on September 7 the eve of the Battle of Ballinamuck. Fr. Dunne went on to become P.P. of Mohill where he died in 1825. Where exactly he was from in uncertain, but his Last Will survives and in it he makes a wish to be buried in Fenagh,replica watches either in his father’s plot inside the old Abbey or with his mother’s people in the graveyard without.